During the third quarter of 2012, I started having stubborn pimples on my forehead. The culprit behind this was probably my 'bangs' and it was aggravated even more by stress and daily exposure to pollution dirt because I just commute to and from my workplace. I felt really bad about it because whenever I talk to people, it felt like they were not looking at me but rather on my pimples. I bet majority of us had been to that phase. The pimples even spread to my cheeks during the last quarter of the same year and that so far, is the worst part. Around November 2012, I decided to have a facial treatment and another one a month after. It didn't solve the problem but the dirt and clogged pores were at least removed. Eventually, I got tired of using different products because they seem to just make things worse. I just resorted to using a mild facial wash and moisturizer. I am happy that I did because the pimples started clearing up. 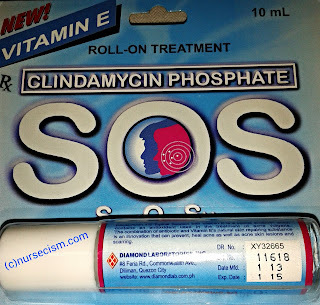 Then I came to know about this product called Save Our Skin (SOS) Clindamycin Phosphate Roll-on. I actually heard this from the pharmacist of the hospital and I got intrigued so I decided to give it a try since I still get bumps whenever that time of the month comes. 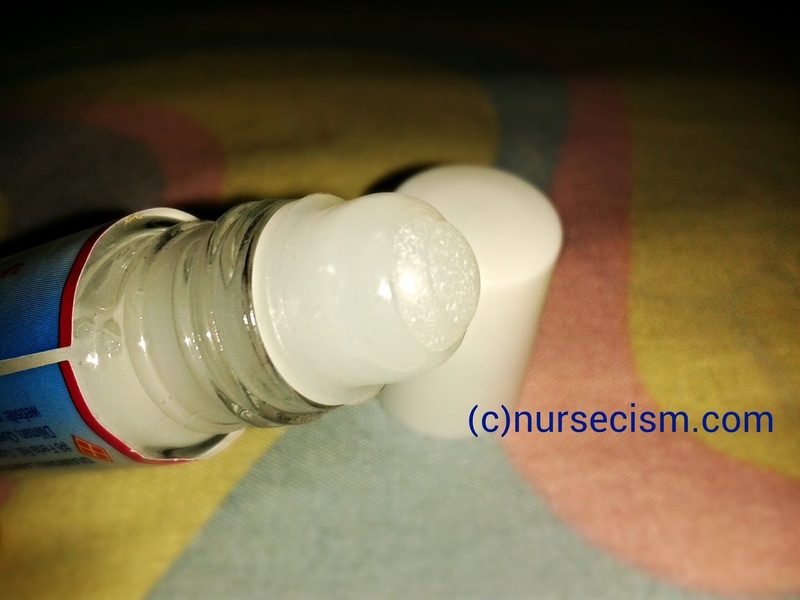 SOS 1% Topical Solution is Clindamycin Phosphate fortified with Vitamin E.
Clindamycin 1% Topical Solution with Vitamin E is a topical antibiotic which contains an antioxidant used in the treatment of pimple (acne vulgaris). Wash the affected area gently with soap and water. You may use warm, moist compress to open the clogged pores. Shake the SOS roll-on and apply topically by gently rolling SOS on the affected area. Avoid the eye area. Use SOS once or twice a day, depending on the severity. 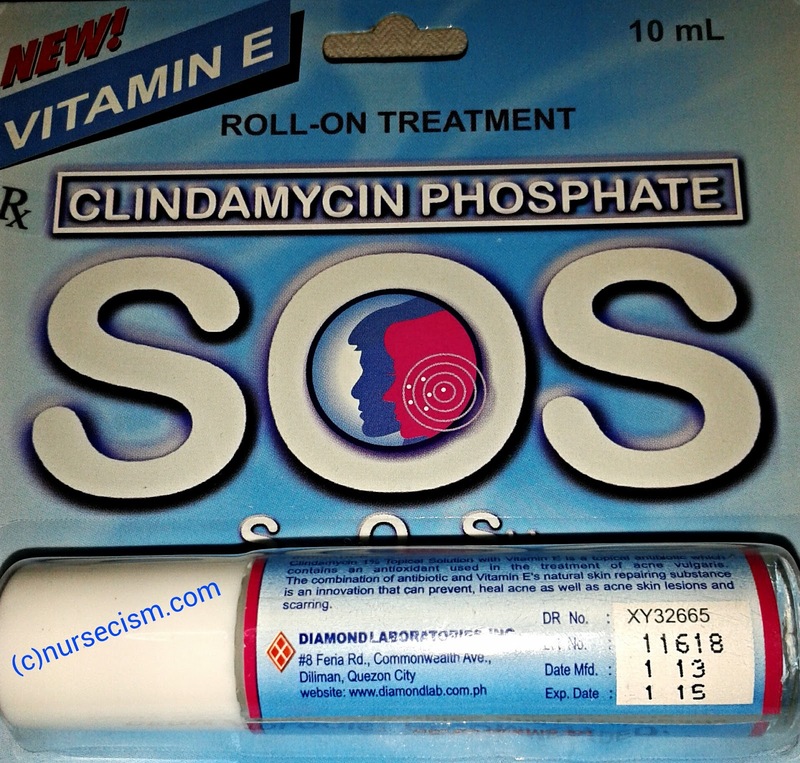 Packaging: Rating (out of 5stars): ☆☆☆ | SOS Clindamycin Phosphate is contained in a clear glass bottle with roll on applicator. This is probably not a great move because it is quite unhygienic as you have to roll it directly to your face. This means that you probably wouldn't want to share the product to others. So what I do when I apply this is I roll the bottle to my clean fingertips first then when I get the right amount of product out, that's what I apply to the pimple. Smell: Rating (out of 5stars): ☆☆☆ | Since this product is an antibiotic, yes, it definitely smells like one. Consistency: Rating (out of 5stars): ☆☆☆☆ | Just right---not thick nor thin. I think it is just slightly thicker than water. This makes it easy to apply and can be absorbed by the skin fast. Healing Property: Rating (out of 5stars): ☆☆☆☆ | SOS Clindamycin Phosphate is not a magic elixir, okay? It wouldn't make the pimple go away overnight. But it surely prevents it from getting any bigger, redder and nastier! It also helps the pimple dry and heal faster (approximately 2-3 days). The combination of antibiotic and Vitamin E's natural skin repairing substance is really an innovation that can even prevent acne lesions and scarring. Overall Experience: Rating (out of 5stars): ☆☆☆☆ | This is a product worth a try. It doesn't sting nor burn the skin post application. Plus, it's effective and super affordable! Have you or someone you know used this product before? How was your/their experience? i am a nurse by prefession. i think this one, if overused can lead into some problem. i hope this one works for me. I think this one's a good product for skin care and treating pimples. The cons are minimal so it's a go for this one. Eek. What does antibiotic smell like anyway? About the purging, how long would it take for it to clear up? im not sure if i would try this one. im not familiar with this product. but u really have a good review. I have so many pimples so I wanna try this one. Ohhh this is the first time I've heard about this product. Thankful that my skin is somehow clear as I don't need to use this but will definitely let my friends know about this :) Thanks for sharing! I tried clindamycin toner that was recommended by a dermatologist to me, it works naman and kumonti yung pimples ko, since mag-aalmost 1 month ko na tong ginagamit, puro dark spots na lang ang natira sa face ko. May mga pimples pa rin pero hindi na katulad noon na malalaki. Effective siya kahit papaano so I'll rate it na 4 pa lang haha. Sabayan niyo yung toner ng retinoic acid cream sa gabi then sa morning acne gel and sunblock cream. Ngayon, kumonti na ang pimples ko, hindi na siya tadtad katulad ng dati. I've tried this one for 1 to 2 months and it's a big YES, this product really works! for me no side effects. Its very effective for the first week I use it, I highly recommend it. Well job S.O.S really save my skin. Pwede po bang bumili ng Clindamycin SOS Phosphate kahit walang Prescription from Doctor? Bumili po kasi ako last week and hindi nila ako binentahan kasi wala daw po akong Prescription.